Look out, Honeywell/Akuacom, there’s a new automated demand response (ADR) challenger in town—and it’s a big one. 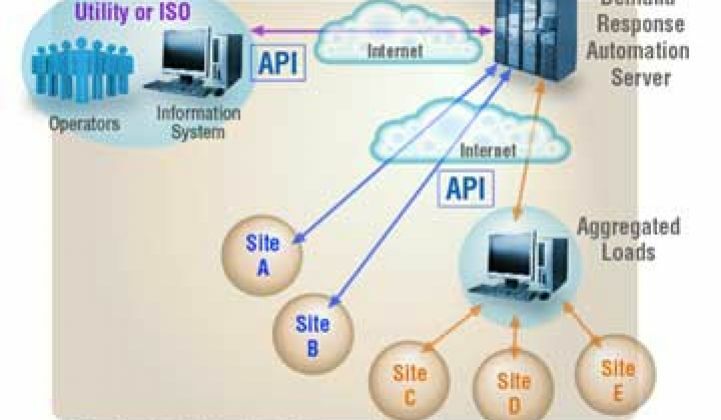 OpenADR -- an emerging technology for connecting utilities and their power users via two-way communications and control systems -- is, as its name denotes, an open standard. The whole point of the Department of Energy and California Energy Commission project that created OpenADR was to spread fast, automated demand response capabilities to the industry at large. But so far, all the big OpenADR deployments have been carried out by a single vendor. That’s Honeywell, which in 2010 bought OpenADR server maker Akuacom, the company that worked with Lawrence Berkeley National Laboratory to bring the technology from R&D to the real world. Akuacom’s servers now run the roughly 260 megawatts of OpenADR-controlled demand response in California, and Honeywell has launched OpenADR-based projects in other parts of the U.S., as well as in China and the U.K.
That’s going to change, however. We’ve seen a diverse set of companies, from giants like Lockheed Martin and Alstom (via its acquisition of OpenADR software developer UISOL), to smaller contenders like Stonewater Control Systems, Powerit Solutions and IPKeys, developing software and hardware to help complete the loop that OpenADR established between utility grid operations centers and customer building energy management systems. Now French building power equipment giant Schneider Electric has joined the OpenADR fray. Last week, it announced a partnership with IPKeys, a maker of OpenADR devices for both utilities and buildings, which will see the two co-develop a set of OpenADR 2.0a-compliant solutions for the commercial market. IPKeys’ role in the Schneider partnership is to provide both the “virtual top node,” or VTN, servers that receive the utility signals at the customer premises, as well as the “virtual end node,” or VEN, client servers that translate those signals into energy-saving actions for building control systems and other end devices. As for Schneider, its various brands of power equipment now run in about half the buildings in the United States and Europe, and it’s also a big smart grid player with its acquisition of Telvent. Last week’s announcement didn’t say much about how the two partners would deploy OpenADR into the market. But Mark Feasel, Schneider’s vice president of smart grid, told me in a Monday interview that Schneider already has a number of U.S. utilities using another piece of the company’s software that could provide a bridge into OpenADR services. That’s Schneider’s Energy Profiler Online platform, which Schneider got when it acquired PowerLogic in 2005. Feasel said the EPO software-as-a-service platform is being used by utilities including Duke, Exelon and National Grid today to connect big commercial and industrial customers to their energy data. About 150,000 metered customers are now getting interval energy use data, up-to-date pricing data, demand charge warnings, and other such energy management insight from EPO, he said. Think of it as a utility-customer energy dashboard, along the lines of what Constellation Energy (now part of Exelon) has developed with its VirtuWatt platform, or the customer demand response control platform that Johnson Controls got with its acquisition of Energy Connect in 2010. That means that customers can see up-to-date power use and pricing data, and make appropriate decisions about how to manage their energy use in close to real time. The platform already supports a curtailment module that can send automated systems, as well as settle the accounts at the end of the events, that could be adapted for OpenADR, Feasel noted. He didn’t get into specifics about how Schneider, IPKeys and its various utility EPO platform customers might be working on that kind of project, however. Schneider is also working on integrating OpenADR functionality more fully into its new line of building energy management software, known as StruxureWare, he said. Other big building management and control technology makers, like Siemens, Johnson Controls, General Electric and Echelon, are incorporating OpenADR into their building management systems as well. As for target markets, beyond Schneider’s EPO users, Feasel said that municipal utilities could be good customers for the kind of utility-to-building connectivity that Schneider and IPKeys plan to provide. After all, municipalities that run their own utilities are providing power to their own city buildings and facilities, giving them a big set of demand-side resources they can tap to serve grid purposes, as well as directly impact their overall budgets. Feasel made it clear that Schneider and IPKeys are providing technology to empower utilities and power customers, rather than getting into the business of transacting that relationship, as demand response aggregators like EnerNOC and Comverge do. On the other hand, any OpenADR deployment will likely come with quite a bit of service support from Schneider, particularly if it happens to come via a hosted platform like its EPO system, which Schneider runs for utilities that brand it under their own name. This won’t be the last partnership to emerge in the OpenADR realm. Schneider is working with a number of startups on demand-side energy management projects that could incorporate OpenADR at some point, Feasel noted. Partners like BuildingIQ, which optimizes building HVAC systems to manage power use, or Enbala Networks, which hooks up wastewater plants and other industrial facilities for fast, automated demand response, are two to watch for developments on that front.